Do you look forward to the start of your working week, or do you secretly dread it? I Like Mondays is all about engaging employees and creating great workplaces. For a long time I’ve thought that ABBA songs should carry a Government health warning. On more than one occasion, I’ve had the song ‘Mamma Mia’ stuck in my brain, infiltrating every quiet, reflective moment of the day. Recently I learned that this is a neurological phenomenon known as an ear worm, (from the German Ohrwurm.) For me it is the words, “Mamma mia, here I go again, My my, how can I resist you?” that always seem to get ‘stuck’, like some nightmare hallucination. Both the gratuitous use of the expression ‘Mamma mia’ (what does that possibly mean – is this person in love with their mother?) and the taunting use of the expression ‘how can I resist you’ seem to get me every time. I should have known better, but on holiday last week, I agreed in a moment of weakness to watch the film version of ‘Mamma Mia’. By such small acts of self sacrifice, I sometimes attempt to ingratiate myself with my family in the hope that it will make me a better spouse and parent. I even agreed to watch the karaoke version and happily growled along under my breath to the irritatingly familiar tunes. But I was still taken unawares by a new aural invader. This time it was the song, ‘Does your mother know’, sung by the long limbed, Christine Baranski, Donna’s ‘other bandmate’ as she cavorts with a half naked man, half her age. The lyrics “Well I can dance with you honey, If you think it’s funny,” have taken hold and a week later, are proving impossible to shift. Trying as always to find the positive from such experiences, it has struck me that Abba songwriters Benny and Bjorn could teach a masterclass in how to make communications stick. What is even more incredible is that they were not writing lyrics in their native language and neither could notate music, but relied upon Agnetha and Frida to interpret the melodies. Imagine if we could use some of their combined skills to communicate with our customers and employers? In ABBA Let The Music Speak, musicologist Christopher Patrick analysed every single phrase of every Abba song, concluding that they were ‘musical economists’ of the highest order, using a simple ‘power of three’ do-re-mi structure to embed the hook lines in the listener’s brains. Elsewhere, other commentators describe how the catchiness of their songs derives from having up to five of these hook lines, or from the sheer outrageous improbability of their rhymes, or from the number of times that the chorus is repeated, or from the fact that their songs describe simple, memorable stories and familiar human emotions like regret and unrequited love. I have to say that the ABBA songwriting team most certainly got their first, even if they discovered the technique by accident. As for what it all means for employee engagement, I have to reflect that there are many times when we could all try harder to emulate the standards of Benny and Bjorn, who by all accounts, worked hard to craft their hits. While we are fond of asking employees whether they understand the strategy of the business, we are less keen on asking them what they can actually tell us about the strategy without being prompted. Could we try harder to help people attach strategic ideas to the velcro of their memory? Here’s a good test. Ask yourself how many of your own communications you can remember a year after you’ve written them? If the answer is less than 5, can I recommend that you spend an hour or two listening to ABBA’s greatest hits for some inspiration? I'm a communication and employee engagement consultant based in the UK. I've worked for a number of leading global brands in the dotcom, tech, telecomms, fmcg, professional services, transport and engineering infrastructure industries. 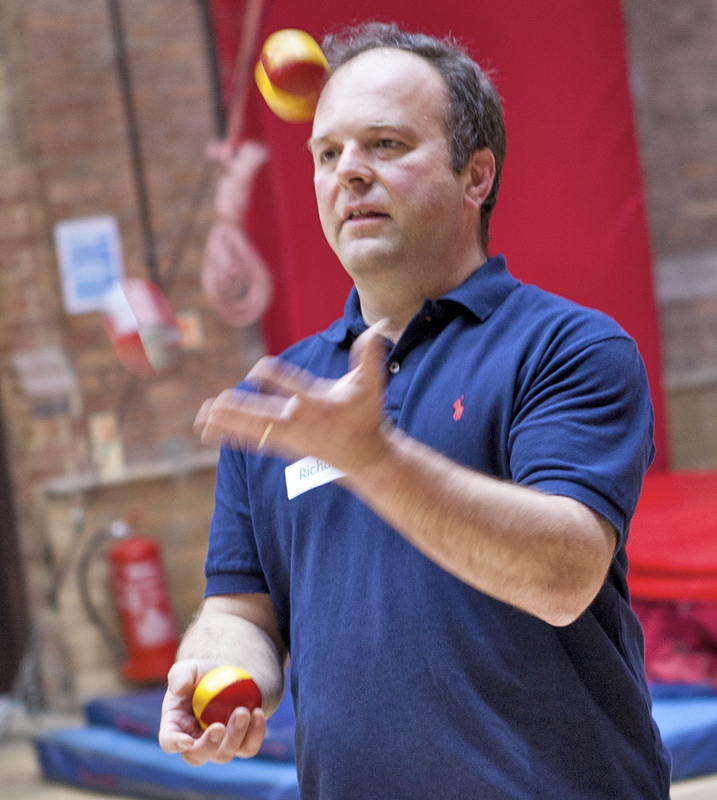 The above photo is of me learning to juggle on an inspired teambuilding day at a circus skills workshop. RVDavies Using auto top-up for the first time on a lunch payment card, I receive an email thanking me for "revaluing" my account. RVDavies Boarding a Lufthansa flight at LHR, general amusement at invitation to join "the economy queuing maze". RVDavies Back in my regular beach writing gig at #purplebeach17. This year the theme is "Who needs balance when you can embrace extremes"
Brian Jones on Multi-tasking or just bad manners?